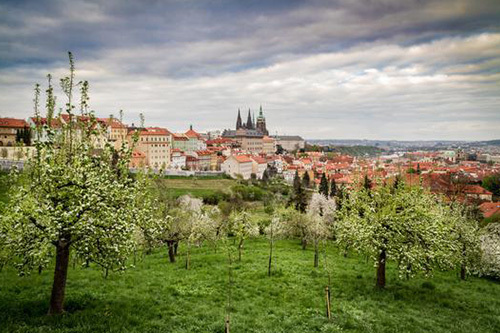 The Prague Castle area, called “Hradčany”, represents a large area situated on the top of a hill above the Vltava river. In the ancient times there used to be a ford. 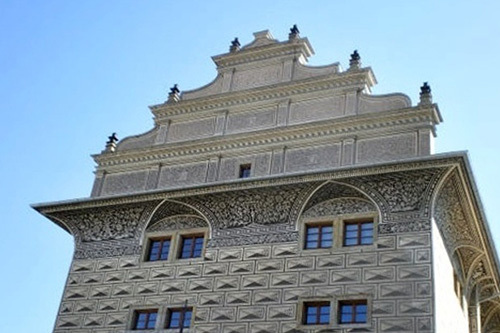 This historic district has always been the noblest and most elegant part of Prague: the ruler used to reside there, the most important noble families of the kingdom built their lavish palaces close to his residence and also artists engaged by the royal court lived and worked in this area. Prague Castle has become an important district also for the Catholic Church: the Archbishop’s palace can be found there, as well as an important Baroque pilgrimage place - the Loreto Shrine. Strahov monastery with its unique library is also part of this area. 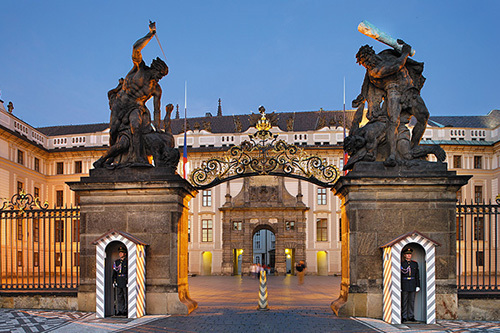 The Prague Castle itself forms a complex of monuments confined within a Classicist palace, where the President has his office. On the courtyards of this palace you can find other monuments, some of which can be visited inside. It was on this elongated hill gently sloping down the Vltava River that the Czech capital was founded at the end of 9th century. 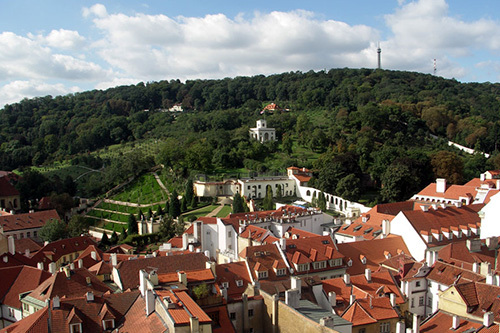 “Hradčany” (the word “hrad” means “castle” in Czech) is therefore the oldest Prague district. The monuments there reflect more than thousand year’s history of Czech statehood. Almost all the architecture styles that originated in Europe in the past thousand years are represented there in harmonious unity. 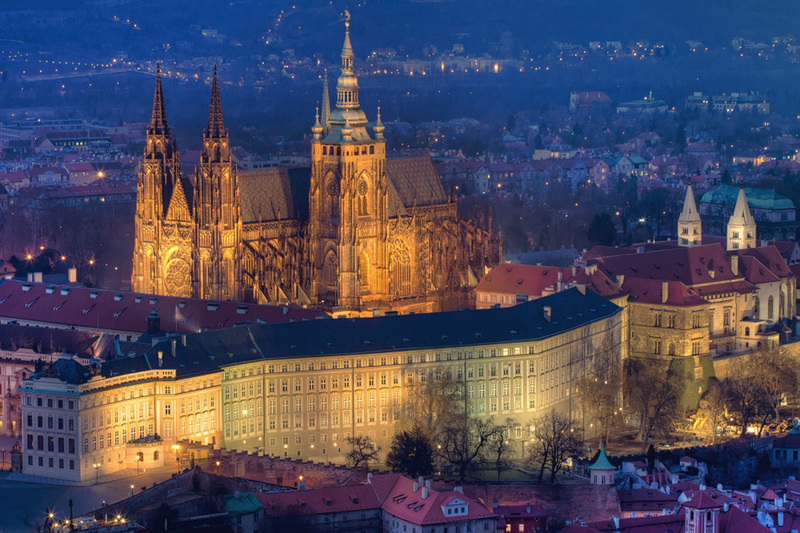 The Saint Vitus Cathedral naturally towers above the numerous monuments that surround it. Together they form individual jewels of a single uniquely beautiful necklace. The Hradčany hill is a calm place with almost no traffic, so the tour there is a relaxing and quiet walk in lovely historic surroundings. 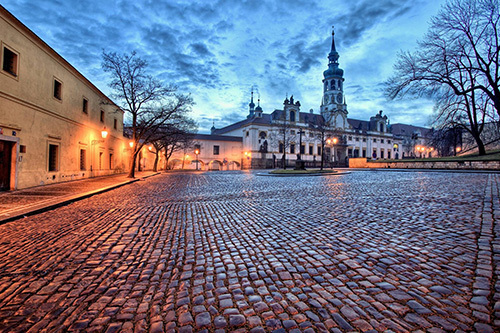 We recommend this tour as an initiation meeting with the capital of the former Czech kingdom. 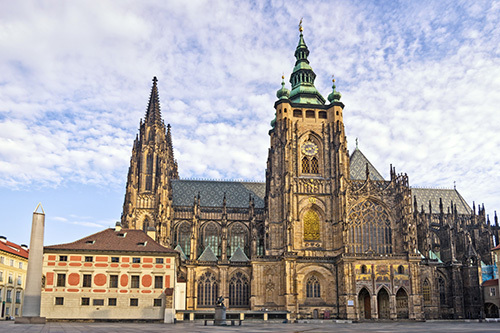 The Saint Vitus Cathedral – the main shrine of the country. 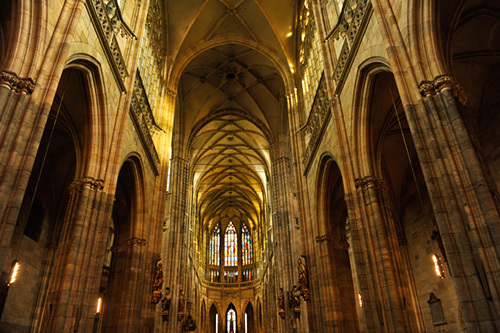 Inside it shelters the most sacred place in the Czech lands – the Saint Wenceslas Chapel, a jewel of gothic architecture. Inside the cathedral you can also see the Baroque tomb of Saint John of Nepomuk, made of more than three tons of silver, or Art Nouveau window created by Alfonse Mucha. The Royal Palace will catch your eye not only because of its graceful Late Gothic architecture and star vault, but also because of its Renaissance halls. One of them is the former Diet, another the Land Rolls Hall and finally the Bohemian Chancellery Hall famous for the act of defenestration. 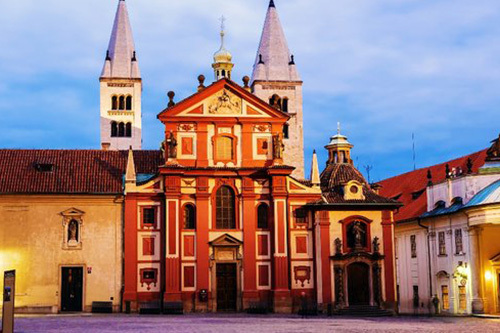 Saint George´s Basilica – this Romanesque basilica from the 10th century is the embodiment of Middle Ages and one of the oldest churches in the entire Czech Lands. Saint Ludmila, the grandmother of Saint Wenceslas and the most honoured patron of the Czech Lands, is buried there. The Golden Lane – Franz Kafka, the famous writer, definitely did not choose one of those colourful miniature houses as his residence randomly: the lane is one of the most picturesque places in Prague. Parts of medieval fortification have been preserved there too. …a pilgrimage place dedicated to Virgin Mary, a Baroque sight at the heart of which there is a small copy of a house where the Virgin Mary was born. Every hour the graceful melody of Loreto chimes invites the ears of visitors to this place. A Baroque arcade, chapels, a small church dedicated to the Nativity of the Lord and a Treasury are also part of this sight. The treasury houses a legendary monstrance called “The Prague Sun” – a dazzling masterpiece decorated with six thousand diamonds. 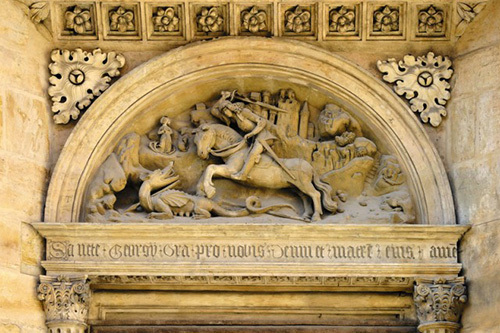 Artifacts from one of the most interesting European treasuries are exhibited in the St. Cross chapel at the Prague Castle. These exhibits are among the oldest shown, as they were created by the hands of mediaeval artists over a thousand years ago. Among the essential pieces in the treasury are the particularly exceptional items created in times when Prague was an Imperial city. They include reliquary crosses, a vessel made of mountain crystal, a board-shaped reliquary, as well as gilded busts of patrons containing relics, various Baroque monstrances decorated with gold and precious stones, as well as stunning precious stones set in richly decorated monili, crosses and gifts to bishops and priests. This exposition is interesting from the point of view of art history and the goldsmith craft, but particularly as an exceptional spiritual experience. ….are terrace gardens with pavilions and Baroque fountains. A pathway down to The Lesser Town (Malá Strana) district leads down through these gardens. This tour can be completed at the entrance to them – the guide will tell you something about this charming green labyrinth before you enter it. You are going to leave the gardens by an exit situated very close to the main square of The Lesser Town – Malostranské square. The pathway out of the gardens will lead you right in front of the Valdštejnský palace, the seat of the Senate. 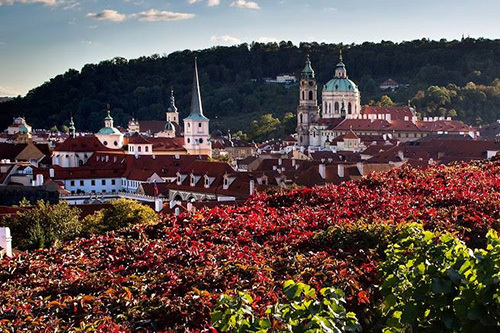 Its own gardens with stunning views of the Prague Castle are also one of the most memorable sights for visitors of Prague. Note: In order to enter the Palace terrace gardens you have to pay a fee. The entrance to the Valdštejnský palace gardens is for free.